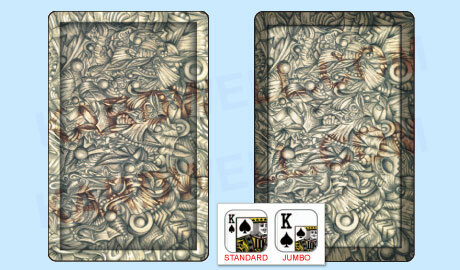 GEMACO Intricacy Playing Cards are made of specially formulated PVC plastic. Stylish and durable, these cards feature the exact snap, shuffle, and feel of GEMACO Classic Playing Cards – the cards currently used at the Taj Mahal and Foxwoods. Each two-deck set features color-coordinated, matching card backs. GEMACO Intricacy Playing Cards are narrow size (2-1/4" x 3-1/2") and available in regular or jumbo index (with large numbers and pips). For additional information or wholesale pricing on Gemaco Plastic Playing Cards, please contact us at 1-800-233-0828. Sale Price: $13.88. Was $29.50. Save 53%.